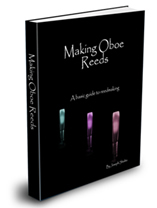 Oboe music with cd accompaniment, especially Music Minus One is one of the greatest ideas since they started recording music. The basic idea behind this is to provide an accompaniment and you play the solo part. Some of these pieces or books come with a version of the solo part played by a well known musician so you can get a better idea of what it should sound like. Because the music is digitally recorded on cd, there is no need to worry about a possible pitch problem with the recording. In the old days, and I am dating myself here, the parts used to be recorded on records. I remember being frustrated because the record player in the basement was a bit faster then the record player upstairs, so it was hard to use. One other advantage to this is if you have any students learning a particular piece. It is a great teaching tool. Here is a list of many of the titles available.